For our second After Nyne @ Venice Biennale piece, our representatives – expert contemporary curators Richard Scarry and Chippy Coates – venture into the mind of Minjung Kim. Off the beaten track we found something rather special by Korean artist Minjung Kim: The Light, The Shade, The Depth. Kim’s serene and quiet works on paper are the result of a controlled and meditative disciplin. Kim expresses a contentedness of the physical and spiritual universe with her use of monochromatic ink and hand made paper. Walking into a large room at the top of the palazza we are confronted by lager collage works that comprises of elliptical/ovoid shapes, made of incense scorched paper. Kim’s works create a stunning and calm experience in the midst of the hectic overwhelming beast that is the Biennale, not to be missed. On the occasion of the 56th International Art Exhibition, the exhibition of the Korean artist’s works made over the last fifteen years curated by the art historian Jean-Christophe Ammann. 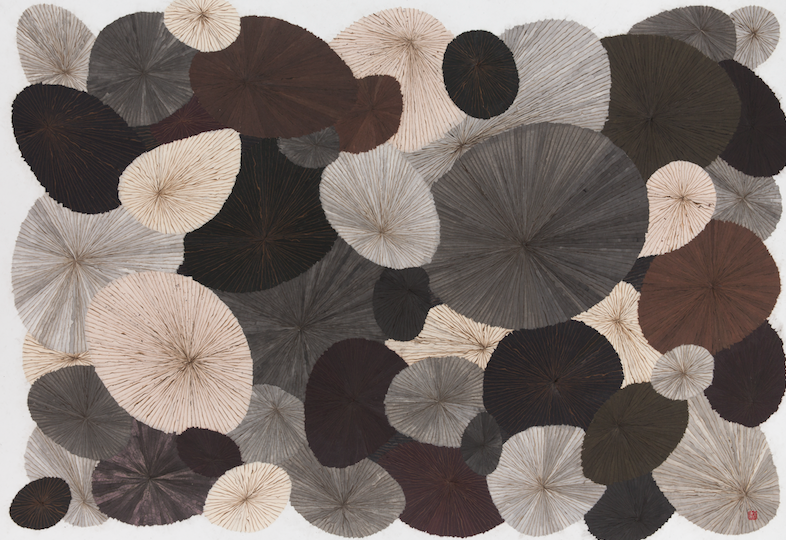 Minjung Kim’s artworks exhibit a remarkable intricacy. Rice paper is painted, singed and exquisitely layered to create landscapes that reverberate with the light, depths and mists of perception; or is intricately wound and twisted generating abstract patterns that team with energy. Collaged out of numerous components, her works always subsume their individual elements into the sensibility of the whole. Using the skills and philosophies developed over decades, Minjung’s works on paper possess a complex materiality all of their own; combining her learning of the traditional oriental arts of watercolour and calligraphy in Korea, with an informed understanding of Western abstract expressionism from her studies in Milan. mood and honed by years of calligraphic training. physical objects but as an infinite universe of processes. Mixed media on mulberry Hanji paper. 140 x 70 cm.